Gen. Issam Abou Jamra was born in the town of al-Kfeir, south Lebanon, in 1937. He joined the Lebanese army in 1956 and graduated from its military academy as an artillery officer in 1959. In 1990, he was promoted to Major General (Liwa). He attended military courses in France and the United States (the last of which was a General Staff course in Kansas in 1980) and was awarded several military decorations. He received a university law degree in 1984. 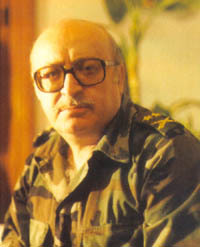 During the course of his military career, Abou Jamra attained high-ranking positions such as the Secretary of the Army Commander in Chief, Commander of the Second Artillery Battalion, Commander of the Second Brigade, Commander of the Seventh Brigade, Inspector General of the Defense Ministry, and member of the Military Council between 1984 and 1990. Abou Jamra served as Deputy Prime Minister in the interim military government headed by Gen. Michel Aoun from 1988-1990 and was in charge of six ministries. After the Syrians invaded east Beirut in October 1990, Abou Jamra and Aoun stayed at the French embassy for ten months, along with Gen. Edgar Maalouf, before leaving for exile in Nice, France. Abou Jamra is an active leader in the Free National Current (FNC), the main nationalist opposition group in Lebanon. This interview was conducted by telephone on April 21. MEIB: What do you think of the response of the Lebanese government to the decision by Israel to withdraw from Lebanon? Abou Jamra: The Israeli decision to withdraw from south Lebanon has confused the Syrian-controlled Lebanese government officials: Some officials like Syrian-appointed Defense Minister Ghazi Za'aiter proposed as a trial balloon that the Syrian army would extend its control to the areas vacated by Israel. Others spearheaded by Syrian-appointed president Emile Lahoud raised a hypothetical scenario whereby armed Palestinian groups would attack Israel and he wondered what the United Nations interim forces in south Lebanon would do in such a situation. He said that his government cannot guarantee the security of northern Israel from these elements. The Syrian-controlled officials have finally "welcomed" Israel's planned withdrawal after they and their masters in Damascus became the laughing stock of the international community especially in the Arab world. This confusion arises from the fact that Lebanon is not sovereign and that the decisions of the Lebanese officials reflect the interests and wishes of the Syrian government. These officials simply follow orders from Damascus. Lahoud's position in response to Israel's planned withdrawal violates the Lebanese constitution, the principles of the United Nations and the letter and spirit of international law. Lahoud's abandonment of his responsibilities is undertaken with the aim of maintaining Syria's occupation of Lebanon. Only by keeping Syria in Lebanon can Lahoud and his government officials safeguard their jobs. MEIB: How do you assess the current American foreign policy toward Lebanon? Abou Jamra: America's top priority in the Middle East is the security and well being of Israel. But it is a fact that Israel can not have security without having peace and calm in Lebanon. Only an independent and free Lebanese government can provide long-term stability for Lebanon and border security for both Israel and Syria. There will be no normalcy in Lebanon until Syria disarms its surrogates and removes its occupation forces. The United States allowed Syria to enter Lebanon in 1976 and brokered the "Red Lines" agreement between Israel and Syria. The United States was also the party that legitimized the Syria occupation under the terms of the Taif "agreement" when it implicitly approved the takeover of the remaining free areas in Lebanon in 1990 in order to win over the support of Syria against Iraq during the Gulf war. Since October 1990, the United States has overlooked the ongoing consolidation of Syrian occupation and the continued subjugation of the Lebanese people. Syria has used Lebanon as a vehicle to settle scores with other countries, exploited and looted Lebanon's economy for a quarter of a century, and oppressed its people. Israel is making matters worse by striking at Lebanon's civilian infrastructure every time Katyusha rockets fall in Israel instead of hitting the real perpetrators in Damascus and their military centers in occupied Lebanon. We are certain that the United States will eventually stand on the side of freedom and justice in Lebanon. We appreciate and salute the United States Congress that has consistently and overwhelmingly stood for Lebanon's independence and sovereignty. MEIB: How can Lebanon take advantage of the momentum created by the Israeli withdrawal to secure international support for the withdrawal of Syria from Lebanon? Abou Jamra: Lebanese in Lebanon and around the world should intensify their campaign to lobby the international community to implement all United Nations resolutions concerning Lebanon, especially Resolution 520, which calls on all foreign forces to leave Lebanon. The implementation of all resolutions will restore Lebanon's sovereignty and ensure peace and security for Lebanon and its neighbors. We cannot rely on the puppet regime currently in Beirut to represent the interests of Lebanon. We should isolate the Taif regime and its representatives worldwide and expose their lies and cover-ups. Lebanon should not fall victim to Syrian expansionism and the Lebanese people should be spared the option of resorting to violence to liberate their country. Lebanese should celebrate the planned Israeli withdrawal from the south. It is high treason on the part of the Syrian-installed officials to link the Israeli withdrawal from Lebanon to that of the Golan Heights. MEIB: As a former high-ranking officer of the Lebanese army, do you think that the army of Lebanon is able to safeguard Lebanon's borders and at the same time maintain internal order and peace? Abou Jamra: Before the Cairo agreement of 1969 that legitimized the Palestinian armed struggle from Lebanon and before the direct Syrian military intervention in 1975, initially under the banner of the Palestinian Liberation Army (PLA), the Lebanese army was capable of ensuring peace and tranquility in the country. The size of the army and its arsenal was much smaller than they are today. The Lebanese army can maintain security, safety, peace, law and order on the condition that Syria does not interfere in the internal affairs of the country. Syria has confiscated the political decision-making process. It installs Lebanon's government officials, appoints the members of the parliament, censors the media, cracks down on dissent and exploits the economy. Syria instigates sectarian tensions to justify its continued occupation of the country. Under these conditions it is impossible and unrealistic to ask the Lebanese army to safeguard Lebanon's borders and ask the Syrian-appointed officials to contradict the Syrian will. When Syria gave its approval, the Lebanese army easily disarmed several militia groups, put down a rebellion in the Beqaa Valley by a Hezbollah splinter group headed by former Hezbollah Secretary General Sobhi al-Tufaili and crushed an uprising led by the radical "Ansars" in the Dinniyeh Mountains in North Lebanon. Instead of filling the vacuum that could be created from the withdrawal of the Israeli and Syrian troops, the Lebanese army is used as an instrument of repression. The army for example is being used to detain and torture university students whose only fault is to distribute leaflets calling on all foreign forces to leave Lebanon. Controlled by a free Lebanese government, the Lebanese army can maintain order and peace on the condition that Syria withdraws its army and intelligence services from the country. MEIB: There is fear among the Lebanese that the 400,000 Palestinian refugees in Lebanon will be settled permanently on the Lebanese soil as part of the final settlement in the Middle East. What practical solution do you propose for this problem? Abou Jamra: Lebanon cannot settle permanently the Palestinian refugees already within its borders. Lebanon is already one of the most densely populated countries. Naturalizing the Palestinian refugees will cause a severe disruption in Lebanese political and social life and will upset the sectarian balance in the country. Very soon the Palestinians will declare their own independent state in the West Bank and the Gaza Strip. The United Nations, in accordance with the newly-born Palestinian state, should resolve the refugees problem by distributing them between their homeland and the large, rich and not so densely-populated countries such the United States, Canada, Australia, the Scandinavian countries, the European community and the neighbouring Arab countries. MEIB: Is the Free National Current going to participate at any level in the upcoming parliamentary elections later this year? Abou Jamra: The Free National Current will not participate in any parliamentary elections until all foreign forces leave Lebanon. Participation will legitimize the Syrian occupation of the country. The occupation regime can only supervise sham elections. Syria will do whatever it takes to win these elections. MEIB: How do you summarize the aims of the Free National Current? Abou Jamra: The aim of the Free National Current is to liberate Lebanon from all foreign occupation forces. We will never accept any Middle East settlement at the expense of Lebanon's freedom, sovereignty and independence. The recent student demonstrations and strikes in occupied Lebanon are a testament that the Lebanese are as determined as ever to restore their dignity and lost freedoms.